Cali Vibe in Full Effect for Murray, Querrey and Gulbis. Defending Champion Sam Querrey Tries a New Look at Farmers Classic. So this is now day five of my coverage at the Farmers Classic and today was more about getting one’s bearings and settling in for the meat of the event. Not just for me as a reporter but also for the players some of which haven’t played a match since Wimbledon. That was very much the case today for Marcos Baghdatis and local favorite Sam Querrey who both needed three sets to get through their opening rounds. But the buzz of Andy Murray’s arrival is still the main focus of attention and even though all the current World No. 4 did today was practice twice on a court in easy view of the dining area and visitors walkway, he felt like the main attraction. And yes, that is Sam Querrey wearing a headband. Even the Cali boy has gone, well, Cali. What’s interested me the most so far has been watching the slight differences between players still mired in the lower reaches of the top 100 versus those that have hit top 50 or better. Janko Tipsarevic certainly had a tough first set against former college standout Somdev Devvarman whose grindy baseline game kept Tipsarevic on edge throughout a tight tiebreak. But despite both men playing similar styles, Tipsarevic’s ability to go from defense to offense by hitting a flat forehand to change the pace of a rally or even try a fine drop shot while at mid-court was just enough to give Tipsarevic a few extra points that gave him the first set breaker and then an easier second set for a 7-6(9), 6-2 win. Or how about the main event tonight between defending champion Sam Querrey and South Africa’s Sam Anderson? Both are tall men who hit tremendous serves with equal power on both their forehands and backhands. Despite being 2-0 against Anderson and having the vocal support of the local crowd, Querrey looked unsure of his shots and his surroundings as if he were playing in some unknown court in a foreign country. And even though Anderson looked and played with more confidence, it was a very nervy first set tiebreak from the South African that saw him blow four set points that was his undoing after Querrey’s lack of conviction continued allowing Anderson to break the American twice in the second set. Despite having the momentum, Anderson couldn’t seem to build on it and perhaps remembered that he was expected to lose. And so he did in a rout in the third set that saw Anderson lose every game much to the delight of the few fans who hung around in the cool evening to cheer Querrey to a 7-6(8), 4-6, 6-0 victory in the over two hour affair. 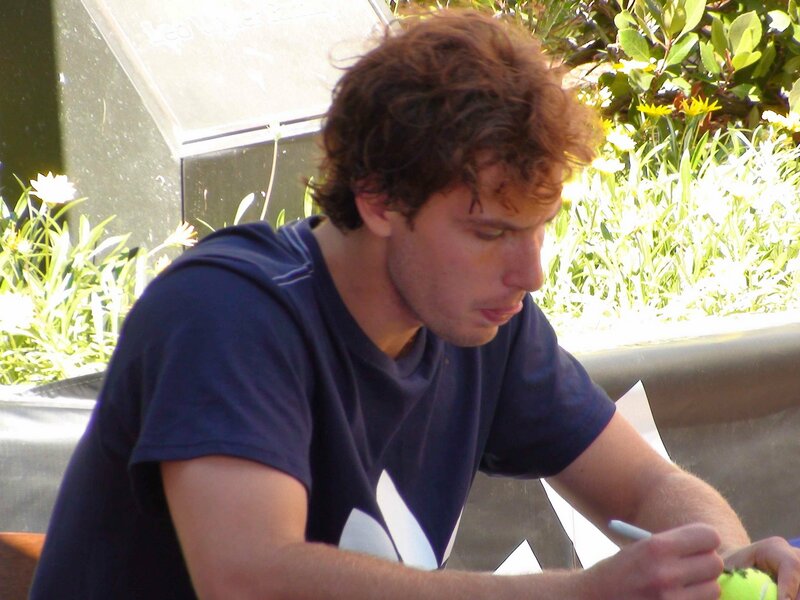 Ernests Gulbis Signs Autographs In L.A. But even with these early round matches, what always strikes me as the cool thing about L.A. is how remarkably laid back the whole event is. A cliche perhaps, but the intimate setting and close proximity of the courts to the dining concourse and shops area allows fans and players to rub shoulders with ease. Even autograph sessions for different players can be very telling in how certain players draw crowds to them. When I got onto the grounds, the line for James Blake’s session was around the block almost, a testiment to how much fans still enjoy Blake’s game and hope he can make one more run at a major. Meanwhile, the line for rising star Ernests Gulbis was a bit shorter and filled with mostly young kids who while in the queue debated on who was the better player, Gulbis or Murray. Gulbis won most of the votes but we’ll have to see how that popular vote plays out should both men meet in the quarterfinals. Andy Murray Serves During the Dinner Rush in L.A.
And maybe it’s this relaxed vibe, along with the muggy weather in Miami, that convinced Murray to get some real matches under his belt after his good yet probably still disappointing semifinal run in London. While on the practice court today, Murray played somewhat of a serious set with Santiago Giraldo, but managed to crack a smile or two and even shared a laugh with some fans who stood just outside the wire fence. Even if Murray doesn’t win L.A., if he can carry the sunny vibe with him for the rest of the hard court season, it might just be the best working vacation he’s had in a long time. Remember to visit my Facebook page for more photos and videos. Click here.